If you are old enough to remember those old non-cordless phones, then you are old enough to remember coil cords—but what exactly are coil cords and what are their practical uses in today’s world? What is a coil cord? Coil cords are recognizable for their spring-like shape, but that coiled design provides the cord with a lot more benefits than just aesthetics. Not only is the cord able to extend further when in use while being able to retract to take up less space when not in use, but that flexibility of design can also create a lot of benefits. Think of trying to charge your cell phone while you still need to use it. Being stuck to the wall is a lot less inconvenient when the cord can stretch and give to move along with you. Coil cords are designed to be able to extend to a length that is up to several times greater than the at-rest length. That means you can stretch the cord further when you need to, and when you don’t, it isn’t going to tediously take up all that extra space—and their ability to self-retract makes them a lot less of a hassle, and less messy to boot. The design of the coil cord means the cord can have that extra flexibility without putting stress on the wire inside—but you need to make sure you purchase a high-quality coil cord from a reputable company to ensure the cord is designed well enough to endure the extra stretching it will do without interfering with the quality or function of the cord itself. What are the uses of coil cords? The sky is the limit. Coil cords are most commonly recognized as phone cords, enabling you to move around as much as you like while on the phone without having to wind up a never-ending straight cord at the end of each call. 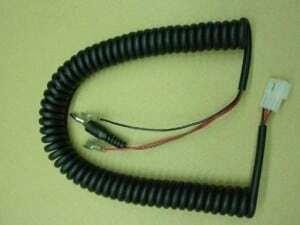 Coil cords are also commonly used for car chargers, and a lot of people like the practicality along with the aesthetic appeal of using coil cords for their electric guitars. However, there really are no limits to the potential uses of coil cords. While they are most recognizably used as simple plastic connectors, coil cords can be built to contain up to three dozen conductors, and they can be made to carry power, data, signal, or a combination. Here at Meridian Cable, we are a leading custom cable designer and manufacturer, and that means we can provide our clients with coil cords that have the quality and capacity to stand up to rigorous use, no matter their intended function. We design our coil cords in a variety of different materials, including PU, PTEE, TPR, SVO and SJOW, to ensure our cords meet your exact usage needs. Further, we are able to use steel, Kevlar®, Spectra® or Teflon® to create added strength for even high levels of mechanical use—as well as to create cords that have all the flexibility without being able to be cut. And, we can even add a UV inhibitor to the jacketing material to extend its outdoor use. Alternatively, we can create non-volatile jacketing in bio-sensitive coil cords specifically for medical applications. We can even accommodate different color specifications in addition to preferences for dull, matte, or gloss finishes. Whatever the use, coil cords can be designed for the application. Contact us at Meridian Cable today to get the coil cord that perfectly matched your every need.